Thanks to the efforts of authors Leah Kramer and Jo Packham, instructions are available for reproducing vintage poodle-shaped toilet paper covers. However, their lesser known cousin, the farting poodle air freshener cover, remains rare as a service to the more demented of our readers, Tacky Living has developed our own version of this classic kitsch craft. 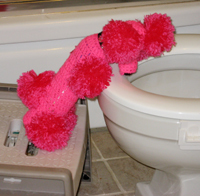 Like the classic toilet paper cozy, this friendly-looking poodle disguises a mundane bathroom supply, an air freshener which is balanced upside down on its spraying end. But the cover also hides a special surprise: when you press the button on the air freshener can, a fine aromatic mist emerges from the poodle’s bottom. Pure bathroom magic! This poodle would make a fine companion for your existing poodle toilet paper cover or an elegant accent for the family throne all by itself. Whip up several and you’ll never be caught short at housewarmings and other gift-giving occasions. You may also enjoy this blog which shows the cover of a vintage crochet book featuring poodle novelties. The eye needs to be large enough to accept the yarn. A needle threader may be helpful. In our example, the nose is created with black yarn. However, such a small amount is used that you may prefer to substitute a button or faux nose instead of purchasing an entire skein of black yarn. Finding this may be the hardest part of the whole project! Of course, you could simply put the poodle cover on a can which is right side up, but then you’d have to remove the cover each time you sprayed air freshener. It also wouldn’t be a genuine Farting Poodle. Rnd 1: Starting at the center top, ch 4. Join with sl st to form ring. Rnd 2: Ch 4, (dc in ring, ch 1) 11 times. Join to 3rd ch of ch 4 with sl st.
Rnd 3: Ch 1. 2 sc in each dc. Join to ch 1 at beg of rnd with sl st.
Rnd 4 – 15: Ch 3. 1 dc in each sc. Join to 3rd ch at beg of rnd with sl st.
You may need fewer or more rows than we needed. 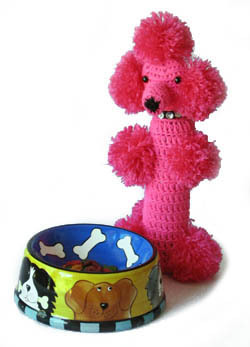 As you work, compare the length of your poodle with your air freshener to ensure that you have the right number of rows. Cut yarn and fasten off at end of last rnd. The head is worked in a spiral with no chains or joins to the previous row. To keep track of rows, mark the end of each one with a stitch marker or a safety pin. Rnd 1: Starting at the center top, ch 2. Make 6 sc in 2nd ch from hook. As with the head, the snout is worked in a spiral. To keep track of rows, mark the end of each one with a stitch marker or a safety pin. Rnd 1: Starting at the nose, with black yarn, ch 2. Make 6 sc in 2nd ch from hook. Cut yarn and fasten off. Rnd 2: Tie main poodle color to yarn end. 2 sc in each sc of rnd 1. (12 sts). Rnd 1: ch2. Make 6 sc in 2nd ch from hook. Rnd 2: 2 sc in each sc of rnd 1. (12 sts). You will need to make eight pompoms. Cut a strip of black felt 1/2″ wide and long enough to fit snugly around neck + 1/2″. With a glue gun or E-6000, glue rhinestones to felt strip. Pack the snout with pillow stuffing. Sew button eyes and faux nose, if used, to head. For an especially dimwitted look, place eyes close together. Sew one pompom to the top of the head and one on either side of the head for ears. Pack the head with pillow stuffing. Sew the pompom legs and tail to the body. Attach collar to poodle either by sewing it on or by overlapping its ends around the poodle’s neck and gluing them together. You’re done! Give your creation a place of honor on the family throne and stand back and admire it. Better yet, take a picture of it and send us a copy.